Trinity Designs: eScape with Stampin' Up! in June! On June 25, 2008, Stampin’ Up! 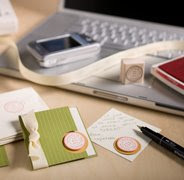 is taking the day to unplug, unwind and reconnect on a personal level with friends and loved ones through handmade cards. We invite you to eScape with us throughout the month of June! Attend one of my Stamp Camps (see my website for dates/times available) or host a workshop of your own! Take advantage of the 25 percent discount on products in the eScape bundle to help you create that special message from the heart.